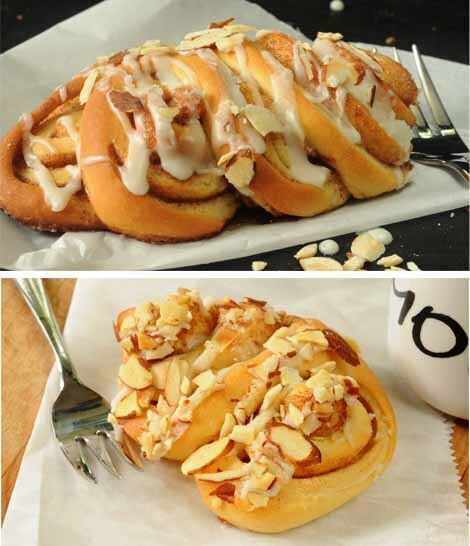 Almond Fans–A Sweet Yeast Roll are really just fancy looking cinnamon rolls with icing and almonds on top. What is your Achilles heel regarding food? 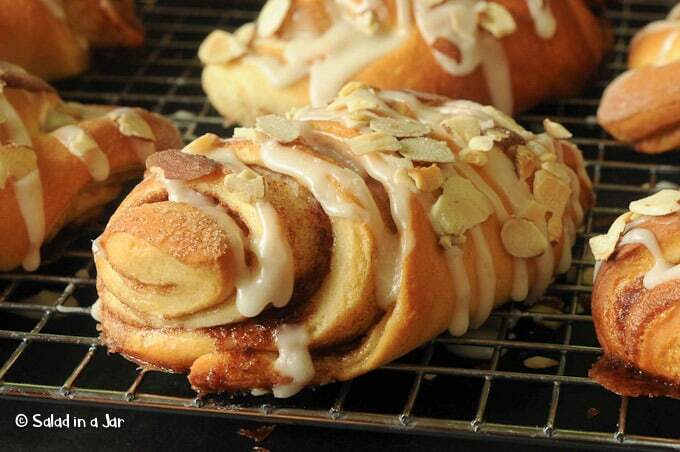 Cinnamon rolls are my weakness. I have no self-discipline when they are in the house. I knew I shouldn’t make these last weekend because they are just fancy cinnamon rolls with almonds on top, but I couldn’t help myself. They were even better than I expected. I’m not admitting how many I ate. I adapted the recipe from one of my favorite cookbooks, Grant Corner Inn Breakfast and Brunch Cookbook by Louise Stewart. I have yet to find a bad recipe in this little book. In fact, I think I will make it one of my goals in life to try every one of Ms. Stewart’s yeast bread recipes. Surely this would qualify me for a Nobel Peace Prize or something similarly lofty. In reality, it would probably land me a spot on The Biggest Loser. Although they look complicated, they aren’t hard at all. 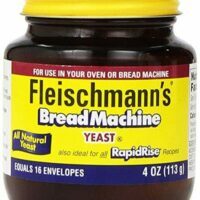 Like most of my bread recipes, I make it in a bread machine. If you don’t have a bread machine, I have included the author’s original instructions in case you find kneading bread by hand therapeutic. Cut flattened log into 10-11 pieces instead of 6. Instead of 3 cuts make one. The final product won’t be quite as impressive as the large one but the calories will be much more reasonable. See the picture below for illustration of roll with 3 cuts (top) and roll with 1 cut (bottom). 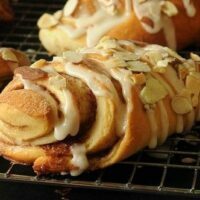 Almond Fans--A Sweet Yeast Roll are really just fancy looking cinnamon rolls with icing and almonds on top. 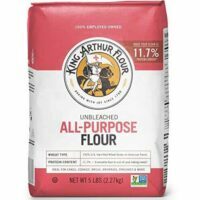 Add ingredients to bread machine in order listed. Set to dough cycle. When finished, remove dough from bread machine pan. On a lightly floured board, divide dough into two portions. Roll each half to 12 x 12 inch rectangle. Spread half of melted butter (2 tablespoons) on one rectangle. Sprinkle cinnamon-sugar mixture evenly over buttered area. Begin rolling from long side and roll up tightly as possible. Flatten log slightly with palms and slice log into 6 pieces. Then using kitchen shears or pizza cutter, make 3 cuts into each slice cutting to within 1/2 inch to the other side. Twist each slice slightly to make it lay somewhat flatter. Place on a greased baking sheet or one covered with parchment paper or a silicone mat. Cover and let rise until almost double. Alternate method for a smaller roll: Cut flattened log into 10-11 pieces instead of 6. Instead of 3 cuts make one. The final product won't be quite as impressive as the large one but the calories will be much more reasonable. See the picture below for illustration of roll with 3 cuts (top) and roll with 1 cut (bottom). Frosting: Soften or allow butter and cream cheese to come to room temperature. Combine butter, cream cheese and coffee or milk together and beat until perfectly smooth. Dip over rolls with a spoon or pour into small plastic zippered bag. 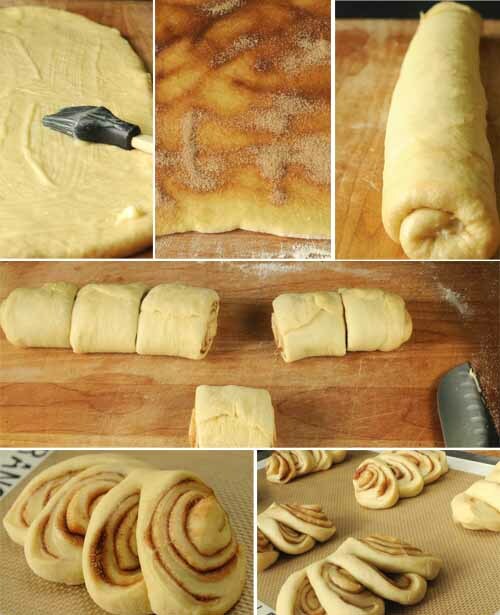 Cut off small corner of bag and use to drizzle frosting back and forth over rolls. 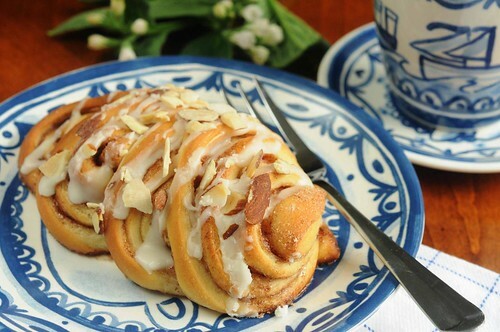 Sprinkle toasted almonds over frosted rolls immediately before frosting dries. Or pick up frosted roll and turn upside down pressing icing into plate of almonds. This insures the almonds will stick to icing. 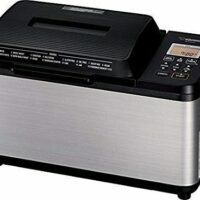 Can you suggest a good bread maker? I really want one, but my last one died after less than a year of light use, and I can normally fix broken appliances, my kitchen is filled with great vintage stuff that just needed a little love. But not that thing, it was ridiculous! Any ideas on a stronger model? Hi Sarah, I cannot remember if I ever answered your question. Please forgive. I have thought about it though. I love my Zojirushi, but of course, it is one of the most expensive. I like the way it has two blades and kneads the dough extremely well. That is, efficiently, without leaving flour in the corners. I’m sure there are many others that would be suitable. I would check places like Ebay and Craig’s List for like-new or never-used machines. So many people buy them and don’t like them because of the way they BAKE bread–something I never do. Have you seen this post? The recipe only mentions 2 Tbls sugar. but in the directions it states that after the yeast , water and 2 Tbls sugar to add the rest of the sugar? how much more? I am completely embarrassed to find I left out such an important ingredient. Add 1/2 cup more sugar. I revised the post to show this correction. I am so sorry. Thank-you from the bottom of my heart for writing. I can see why these are so deadly!!!! The frosting made with the coffee was incredible, and I don’t even Like coffee!!! Add that to cinnamon rolls and lets just say we are DONE!!! I used maple sugar instead of white and added a sprinkle of nutmeg. Haven’t eaten one yet, seriously afraid to start! Thank for the recipe!!!! Guess they are all gone by now but hope you liked the almond fans. They are one of my favorites. I can imagine the maple sugar was wonderful. These look amazing, I’ve got the dough in the breadmaker now! One question, about how much confectioner’s sugar did you add to the icing? Thanks! I can’t wait to try. Thanks for the recipe and tips for Ms. Stewart’s book. Beautiful! It is stunning how easy this beauties are made. I love cinnamon rolls, so I have to try them! These cinnamon rolls look so yummy!!! Thanks for the recipe, I’m gonna try it out soon! You make it look so easy. I am going to have to try it. Those almond rolls look beautiful. I really enjoyed how you provided the photos and recipe. I will make these next week for my kids. As usual, these breads look too delicious. I don’t know how you cook all this and stay in shape. I would gain so much weight. They look so good though that it makes me want to try to cook them. These look delicious. I don’t have much success with bread, but for some reason I can make cinnamon rolls that turn out fairly decent. I bet I could make these! I can almost smell them here…lovely! Fabulous photos! I use my bread machine for most all the bread I make, too. Although, I love to knead the dough-time is of the essence most of the time. I love how your blog is set up-the little jars for categories are very cool. Congrats to Gina! (I’m jealous, but I’ll get over it). 🙂 This is SO odd… I’ve got sticky bun dough rising, and cinnamon roll dough rising. I’m making 2 versions to take to work tomorrow. We must be symbiotic (or whatever that is…) but I LOVE almonds!!! I am making these…. for sure …. for sure…. and I love the addition of sour cream in the dough. They look stunning!!! Beautiful! I’m sure I could eat quite a few of these. I don’t have a bread machine, but I use my stand mixer to knead – it’s therapeutic to watch it do the work! These look amazing… I guess I really do need a bread machine! WOW! These look amazing. After looking at the pics they don’t look as intimidating either. I will definantly be trying these. Yum – these look great! Thanks for the gift card – it’s so exciting to win something! These look delicious. I was so struck by the photo and how you acheived that look…thank you for sharing the technique, I am going to give this a try as these look so impressive. You are such a fun read! umm… heavenly delicious! I just love sweet, yeasty rolls!